Want to learn more about Brittany Spaniels? We’ve created a Brittany Spaniel page with the article The Brittany Spaniel: An Extraordinary Bird Dog by Michael Russell, as well as a bunch of other excellent Brittany Spaniel links. It bothers me as a breeder and trainer of brittany’s for over 23 years, that so many people continue to refer to the breed as Brittany Spaniels. The AKC removed “Spaniel” over 25 years ago. If you are going to publish information on our breed it would be nice if you truley knew what the breed is called. Thanks for your feedback, it helps us build a better site. Hound TV is a hobby site – we’re not Brittany experts or even dog experts; we just love dogs! Anyway, when I followed up on your comment, I found that in most places, they are indeed referred to as only ‘Brittany’ without the ‘spaniel’ – although descriptions of the breed explain that they are a spaniel-type dog. One notable exception was Canada, where ‘Brittany Spaniel’ seems to still be in use (see the Brittany Spaniel Club of Canada and also the Canadian Kennel Club). Actually the Brittany is not of “spaniel type”. It is of Pointing or perhaps even Setting type. aww…Brittany Spaniels are soo cute! keep the pictures comming!! We are so glad you added a Brittany page. We have 7 of these amazing dogs. As pheasant hunting outfitters, we know that these guys are our bread and butter of the operation. We see a lot of different hunting breeds during the hunting season, but have not found another breed that outshines the Brits. Brittany’s are smart, easy to train, want to please, sensitive, friendly, loving and have the energy to go all day. The focus of our breeding program is for #1 – personality we expect our pups to be an asset to every family #2 exceptional hunters – a line of champions proven in competetion and in our operation as South Dakota hunting dogs #3 – looks and style – color, coat, sleek, markings and expression. 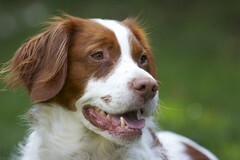 If you are looking for a hunting dog that fits in your family take a look at a Brittany. i am looking to buy a brittany dog in the illwarra/sydney region of NSW,Australia.I am willing to pay $500 or less for the dog but i can find any breeders.Does anyone have any info?? A good starting point might be the Dogs NSW Breeder Directory. You could also try contacting the Brittany Club in Victoria. Hope that helps!